S.D. Burman had already started recording the songs for 'Aradhana' and used Rafi's voice for the first two but became very ill shortly thereafter and had to be hospitalized. The responsibility for finishing the soundtrack fell on his son, Rahul Dev Burman and although R.D. 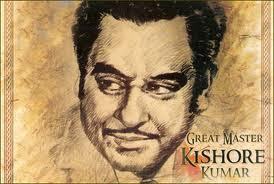 was relatively new to Bollywood, he had always been enamored with Kishore's voice. The younger Burman broke tradition and recorded the remainder of the songs with Kishore, convinced that Kishoreda would be able to hit the nuances of the songs better than Rafi could. 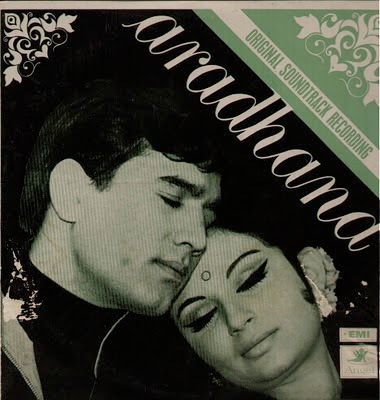 'Aradhana' became a blockbuster hit and that one movie changed the entire landscape of Bollywood for years to come. Rajesh Khanna became the biggest movie star of the day and no one, not Raj Kapoor before him or Amitabh Bachchan after, could match the way he owned the silver screen for the next five years. Kishore fared even better, after the success of 'Aradhana' he became the most sought after singer in Bollywood until he passed away and had few if any peers to his craft. This is great - I am learning so much... I look forward to reading more. I love Kishore's voice in the songs from 'Aradhana', and never tire of listening to those songs, and I love many songs that he did in the 70s - but I am not very familiar with his older (60s and pre-60s) work - this post and the previous one have given me some clues as to where to start looking. odd hit in "Padosan" ? I think you were not born when this movie came up. It was "Padosan" songs that made Kishore Kumar the number one male playback singer in Hindi movies. Songs of "Aradhana" and other movies came later. It was the song "mere saamne waali khidki mein " from "Padosan" that clinched it for Kishore Kumar. It is Kishore Kumar and R D Burman who took the Bollywood music world by staorm with "Padosan". Rajesh Khanna's phenomenon arrived a couple of years later and that too was helped along by Kishore Kumar and R D Burman. Actually 'Padosan' came out the year I was born - 1968. You are correct in that those songs started his comeback. However compared to his previous success it was rare hit (even though it remains one of my favorite movies). 'Aradhana' came out the following year in 1969 and catapulted Kishore to the top. A spot he would not relinquish till his untimely death in 1987. It is completely wrong to say that SD Burman fell sick after first two songs and RDB brought in Kishore and completed the songs thereafter. There are several proofs available including interviews with Shakti Samanta, Late Manohari Singh, Bhupinderji, Kersi Lord, and several other musicians present during Aradhana who swear that all songs are by father SDB. Anyone wanting more details can contact me on amkon1@yahoo.co.in and get all the details. The songs that S.D Burman is to have written are completely different in rhythm and structure than the ones that R.D is said to have helmed so it's not out of the realm of impossibility that there would be truth to the rumor. It is a matter of great controversy and since all the principals in this have passed on it will be impossible to get the actual truth. What is without dispute is that Kishore did amazing work with both father and son - with the Sachin Dev he learned his craft and with Rahul he perfected it.